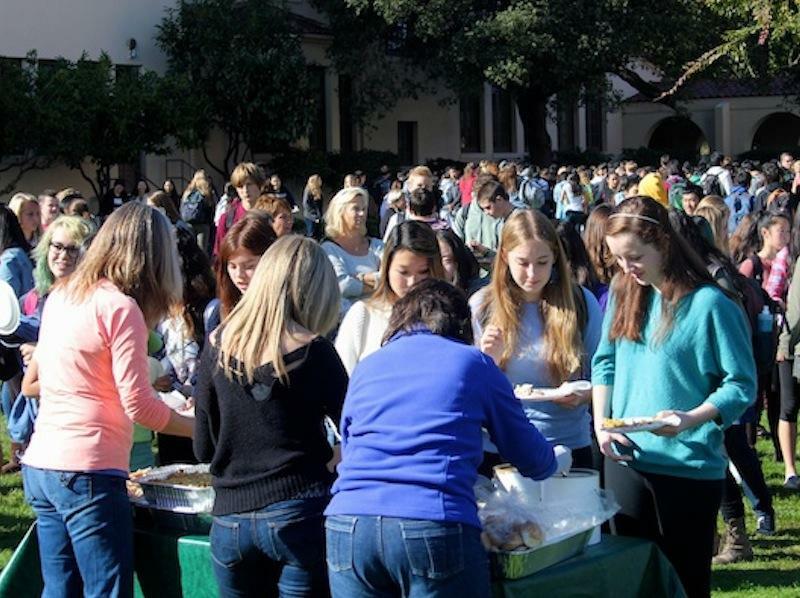 In celebration of Thanksgiving, Palo Alto High School’s 12th annual Turkey Trot will take place during an extended lunch tomorrow from 11:45 a.m. to 1 p.m. on the quad. At this school-wide event, students will share a full Thanksgiving meal, including turkey and stuffing, and other traditional holiday foods. Vegetarian and gluten free options will be provided. Students anxiously await their meals during the 2015 Turkey Trot. Photo by Sherwin Amsbaugh. Those who wish to purchase lunch must bring either five dollars in cash, or two dollars and three cans of nonperishable food. According to Melissa Anderson, a parent volunteer who helps organize the feast annually, cans will be donated to the Ecumenical Hunger Program in East Palo Alto. As stated by Anderson, cash proceeds will be put towards the feast, and all excess money will be donated as well. According to Anderson, the Turkey Trot tradition began at Gunn High School in 2004, before it was brought to Paly the following year, with the hope of spreading Thanksgiving spirit to the Paly community. “It [The Turkey Trot] is intended to be a community event, giving us all the opportunity to be together, be grateful for our blessings and generous to others,” Anderson said. Due to the extended lunch, tomorrow will feature a modified C-day schedule. Class periods will be 45 minutes long, with lunch beginning at 11:45 a.m. and ending at 1 p.m. Junior Ellen Goncher is especially excited for this year’s trot. For those who are not as keen on the classic holiday meal, many still enjoy the extra 35 minutes by treating themselves to lunch off campus. Senior Mack Saitz will be taking advantage of the special schedule and making the trek to San Francisco.